How many Super Moms do you know? We bet it’s a lot because our community is full of inspiring women that are skilled multi-taskers who juggle taking care of their families, successful careers, household responsibilities, carpools, sports team schedules and volunteer work with a finesse that only moms have. 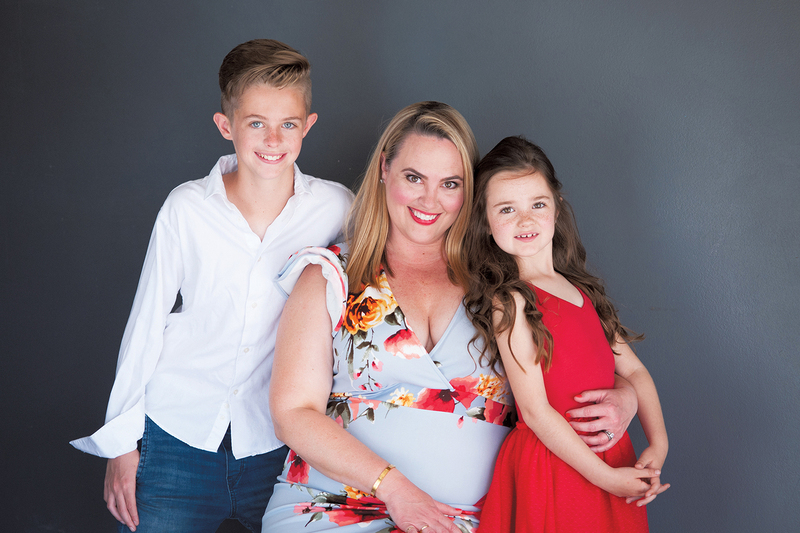 Every spring we ask our readers to nominate some of these extraordinary women that are making a difference in the community through their dedication to their families, careers, nonprofits and education, so we can highlight them in our pages in honor of Mother’s Day. We love reading the nominations that come in from husbands, children, friends, neighbors and coworkers describing the Super Moms in their lives, making it extremely difficult for our committee to select just a few to highlight each year. Below are our 2018 Super Moms with their original nominations and their “Super Mom” stats. While they were all selected for different reasons, they all embody what it means to be a Super Mom! 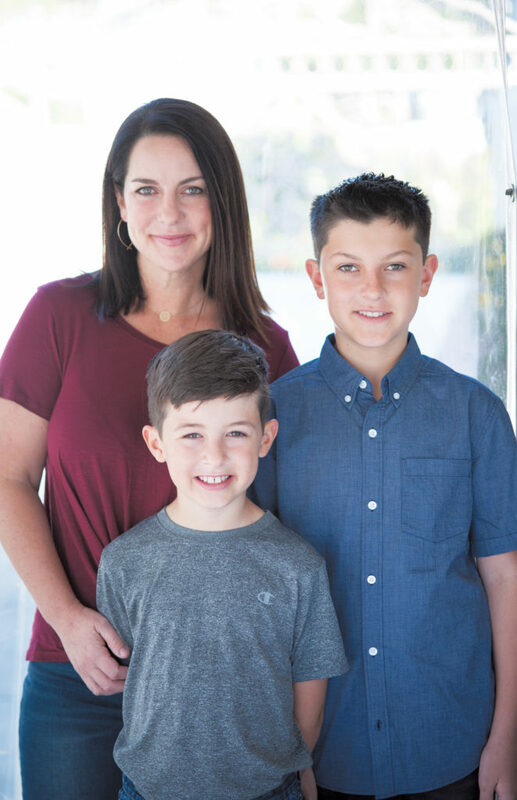 A special thank you to Playa del Rey’s Ballerini Cooley Studios for partnering with us on our Super Moms issue and providing our honorees with a fabulous family photo shoot. We’d also like to thank the local businesses that provided gift cards to our Super Moms to help celebrate! Happy Mother’s Day to all of our community’s awesome Super Moms! Nomination: I would be beyond honored to nominate my awesome wife and Westchester resident, Mary Ann DiMaria, as a Super Mom! Above anything, Mary Ann puts her family first. I feel extremely fortunate to be her husband, and I know our sons, Jake (8) and Dylan (13), feel extremely fortunate to be her kids. To call Mary Ann a Super Mom is an understatement. 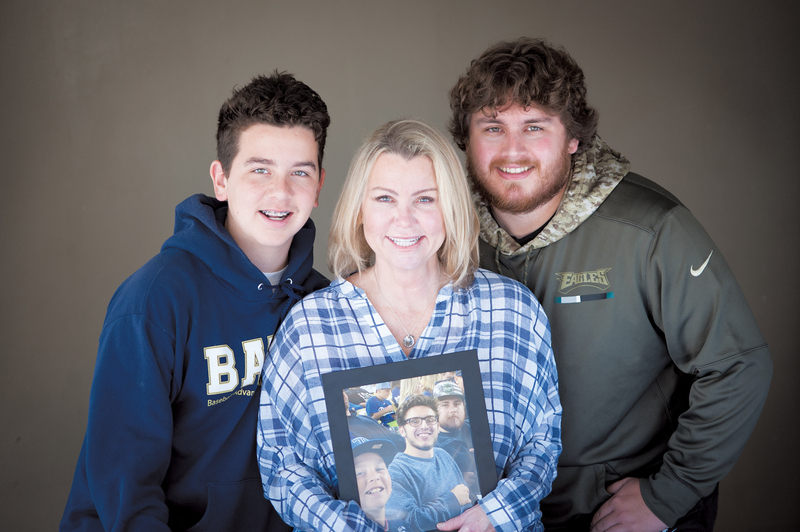 She is very involved in the lives of our boys from picking them up at school to picking up after them around the house, to helping them with their copious amounts of homework. It is no surprise that Dylan is now on the honor roll at school, in part due to her efforts at home. Our kids are very busy in sports and “Mom’s Taxi” is always in service! Mary Ann is truly the glue that keeps our family together, and the kids and I love her more than she will ever know. Mary Ann is a stay-at-home mom, which is a career that is ten times harder than my hardest day at work. She not only manages our family, our finances and our residence in Westchester, she manages our other real estate investments. And she has been doing this very successfully for nearly 18 years. She has a knack for finding, buying, selling, beautifully remodeling and maintaining properties. Mary Ann is also a very active parent in our children’s school, WISH Charter. She consistently finds ways to help out by volunteering whenever she can in the classroom, assisting teachers and chaperoning on field trips. She’s the go-to mom when it comes to designing tickets for school events, and it’s very common to find her contributing her creative, hand-prepared dishes for events like the “WISH Cafes” to earn money for our school. Mary Ann is not only a Super Mom and a super parent, she is also a super member of our community since 2009. Over the years, she’s lent her heart and her time at local beach clean-ups, the Rock Roll & Run 5k for Education, spreading Christmas cheer by caroling in the neighborhood and wrapping presents for underprivileged families at a wonderful holiday event by Sore Feet Saviors, at cotillion classes at the local Elks lodge (even winning 1st place in the mother/son dance! ), and as part of our national community, flew to Washington DC to participate in the Women’s March with thousands of other mothers and advocates from around the country for equal rights. –Nominated by husband Mick DiMaria. What is the best part about being a mom? My boys are extremely different from each other and I love that. I have one who loves anything adventurous/dangerous, the other is decidedly cautious. One dresses up for anything and everything, the other doesn’t even like to wear a costume on Halloween. I love that they are different and between the two of them I get a little of everything! But, my favorite part about being their Mom is hearing them make each other laugh… nobody can crack them up as much as they do each other! What is the best tip you can share with other moms or local families? Find your people. We’ve been in the community for nine years and it wasn’t until five or six years ago that I really found this for myself. Having support—whether it’s sharing struggles over coffee, celebrating good times and a glass of wine, splitting up kids’ extracurricular shuttle duties, having help when you need a last minute sitter, or even weekend getaways with other families—it makes a huge difference. As a Super Mom, what do you consider your “super” power? I can’t think of a “super” power. Truthfully, my first response, when my husband Mick told me I had been selected was, “What?…no you didn’t!” I know and recognize that there are so many “Super Moms” in our community and many who do much more than me. But, the big picture is, I do what I can—and if my husband and kids think that I’m a Super Mom, then that’s all that matters. Nomination: Amanda is a proverbial gumbo of different personalities––a sweet Southern belle, a passionate idealist, a dynamic force of nature and a critical perfectionist. All of these qualities combine to make her an incredible mother to our two incredible children, Stellan and Gable. There is one dominant element in all that she does: unequivocal love for her children and this community. I have had the privilege of parenting our kids with her and witnessing her tireless focus and relentless support of their development. She is undoubtedly a Super Mom. For the past several years she has ensured that Stellan diligently practices piano, and maintains a 4.0 GPA, which was recently validated with what we hope to be the first of many musical scholarship awards. The monthly Broadway musical she selects for him to study has no doubt been instrumental in his love of music. She also spends countless hours driving Gable to auditions and acting jobs that are usually, and inconveniently, in Hollywood at 4 pm. Nevertheless, Amanda persists in pushing and supporting both of our children to achieve greatness on their own terms, and does it all with undeniable love. That love is also shown through her dedication to WISH Community School, where she has been an active force in building the school community since it opened its doors in 2010, acting as cheer coach, class parent and volunteering tirelessly and constantly. One of her proudest accomplishments is planning, organizing and producing the annual Teacher Appreciation Week activities for almost 100 teachers and staff, including providing such things as sound baths, donut walls, personalized coffee delivery and gourmet catered lunches. Another notable accomplishment is the “Fill the Fridge” campaign she started in 2012 that provides healthy snacks, vitamins and beverages as a welcome back to the teachers at the beginning of each school year. She gives so much of her time and heart to the teachers and administrators in order to help build the school community she envisions. I cannot think of a more deserving recipient of this Super Mom honor. –Nominated by husband Matthew Swanlund. What is the best part about being a mom? Helping my kids find their passion. As they get older, you begin to enjoy the fruits of your labor and seeing them flourish into kind people with progressive ideals is immensely satisfying. What is the best tip you can share with other moms or local families? Be a little selfish––have a facial, buy the expensive lipstick, go on the girl’s weekend. Indulge now and then; you deserve it! The best gift you can give your child is a mom who loves life. As a Super Mom, what do you consider your “super” power? My mom was particularly adept at making the mundane day to day stuff magic, and it’s something I aim to do for my kids. From “FlufferNutter Fridays” to monthly musicals, I want them to know you create your own joy in life. We celebrate every little thing in our household. Nomination: My mom, Jackie Aguilera, should win your “Super Mom” contest since she is the most super of all moms. My mom is a partner in one of the biggest law firms in the U.S. and clients call her every minute of the day. But that doesn’t stop her from being a Super Mom to me, my school and our community. She has raised three boys in Westchester, she volunteered a lot at Del Rey American Little league, Beach Cities, and the YMCA (all teams I played on), and she spends a lot of time helping my school, St. Anastasia. She teaches mock trial at St. A’s for middle-schoolers, helps every year with the annual fundraisers by hosting parties and sending out letters and goes on as many field trips with my class that she can. My mom is super because she can plunge a clogged toilet with a plunger in her hand and her briefcase in her other hand, even though she is late for her big presentation. When she was pregnant with me, she got “morning sick” all over her car, drove into the nearest car wash, and still made it on time to court. My mom can do conference calls during our carpools, and she can do all kinds of work on emails in between my games (sometimes by making a quick stop at a Starbucks). She is also really funny and jokes with me all the time, and we have laugh attacks together. Most importantly, my mom never misses any chance to be with me. Every time I want to practice basketball, football or baseball with her, she drops everything she’s doing and says yes. If I want to play hide-n-seek or go out ding-dong ditching with my friends, she always plays with us. She never misses my games (and even goes to a lot of my practices), talent shows, plays, piano recitals or anything else I do. She may be there with her laptop and cell phone in her hands, but she is always there to see me. That is why my mom is a Super Mom. –Nominated by son Jack Aguilera. What is the best part about being a mom? Finding my true calling and a purpose I never knew I wanted. Falling in love with each stage of their lives as they grow up, and loving the current stage as much as I loved the past stages. Being welcomed into a life-connected group of Westchester moms who are always there when I need them regardless of circumstance, without judgment and who truly “get it” when others don’t. What’s your favorite way to spend Mother’s Day? Doing absolutely nothing (except for opening gifts)! What is the best tip you can share with other moms or local families? Enjoy every minute you can with your kids–-no matter what they are doing. You will remember every small or fleeting moment of your child’s life regardless of how long ago it happened, which is something you can’t say about your job or your career. Drop what you’re doing–it can wait–and go hang out with your kid. What’s your favorite place in the community to take your kids or family? Hacienda (Go DRALL!) and Kabuki. As a Super Mom, what do you consider your “super” power? Multi-tasking and dispute resolution. Thank you to the following businesses for donating to our Super Mom gift bags: Hornblower Cruises and Events, Tony P’s Dockside Grill, Cantalini’s Salerno Beach, Flowers by Felicia, Ayara Thai Cuisine and Marisa Cardenas/Head to Toe Salon. Photos by Ballerini Cooley Studios. Posted May 2018.